Environmental samples analyzed by quantitative PCR (qPCR) are subject to interference by inhibitors present in the environment being sampled. 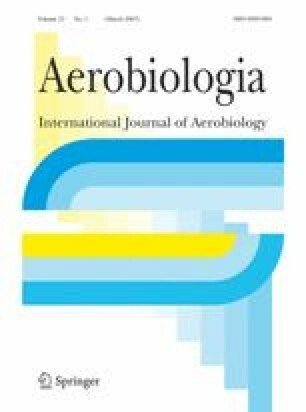 A controlled determination of the effect of inhibitors associated with sampling indoor air and the ability of internal standard controls to detect inhibition was carried out by filter collection of air samples followed by spiking of the filters with green fluorescent protein-expressing Aspergillus fumigatus conidia. Microscopic conidial counts were compared with qPCR results and correlated with levels of particulate matter and viable airborne microorganisms. Our data showed that PCR can be inhibited by masses of particulate matter as low as 50 μg and that the amount of inhibition was positively correlated with the mass of particulate (r = 0.75) and the number of non-filamentous organisms (r = 0.73). The use of internal standard DNA identified the presence of inhibitors and indicated the need for additional sample processing or qualification of sample results. We thank Brian Schofield, The Johns Hopkins University Bloomberg School of Public Health for assistance with the microscopy. This research was supported in part by a Johns Hopkins Center in Urban Environmental Health pilot grant (ES03818) and a Johns Hopkins NIOSH Education and Research Center Pilot Project Research Training Award (T42/CCT31049-09).